With over 20 years of experience in dental implants in San Juan Capistrano, California, Dr. Emil Hawary can transform any smile from unpleasing to fantastic. Dental implants are an option available to replace missing teeth. A dental implant is a titanium rod that is fused to the jawbone in order to function as the tooth root, which will support a dental crown. To replace multiple missing teeth, a few implants can hold a bridge, dentures, or partial dentures. The replacement teeth will look and function like natural teeth and can improve a person’s ability to smile, speak, and chew properly. Although dentures and bridges that are supported by the natural tooth root can remedy many of the problems associated with missing teeth, they cannot prevent future bone loss the way dental implants can. This is why dental implants are often recommended to most patients who need to replace missing teeth. Few people know that when a tooth is lost, the lack of stimulation to the supporting jawbone causes a decrease in bone volume and density over time (atrophy). As the jawbone shrinks, the overlying muscle and skin collapse along with it, which can make a person appear older than their actual age. Dental implants are a solution for patients of all ages, with the exception of growing children. Although ideal candidates are those who have good oral and general health and have adequate bone mass, dental implants may be used on patients who do not meet these criteria. Dental implants have been successfully placed in those who have existing medical conditions, such as high blood pressure and diabetes. Those who have lost their teeth and have experienced bone loss as a result of periodontal disease or decay have also experienced good results with dental implants. Certain procedures, such as ridge augmentation or a sinus lift, may be necessary to improve jaw deformities or to ensure that the dental implants have enough bone to attach to. During a consultation at Art of Dentistry Institute for tooth replacement in San Juan Capistrano, CA, your health history and the oral and dental structures will be assessed to determine if you are a candidate for the procedure. Endosteal Implants – The most common type of dental implants, these are surgically implanted directly into the jawbone. Subperiosteal Implants – Subperiosteal implants are placed under the gum but above the jawbone. These dental implants are for those who have a shallow jawbone but cannot or do not want to undergo a procedure to rebuild it. Replacing a single tooth – One dental implant with a crown cemented or screwed to it will replace a single tooth. Replacing several teeth – Fixed bridges will replace several teeth using few to several dental implants. Adjacent natural teeth may need to be shaped or cut down to receive the bridged crowns. Replacing all teeth – Dental implants can support a full bridge or full dentures. The exact number of dental implants required to provide adequate, long-lasting support depends on many things, including the amount and quality of existing bone, the bite, and other anatomic factors. If you need to replace one, a few, or all of your teeth, dental implants may be the solution for you. During the initial consultation for teeth replacement in San Juan Capistrano, CA, all aspects of a patient’s smile are assessed to help determine the best treatment plan and to ensure that the most aesthetically pleasing result is achieved. We at Art of Dentistry Institute want to ensure that your desired results are achieved in the best possible way. To find out if you are a candidate for dental implants in San Juan Capistrano, California, contact us at 949-955-3366 to schedule a consultation. We look forward to hearing from you! 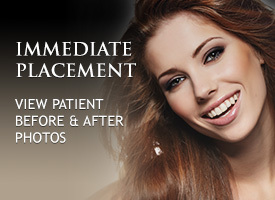 Implants San Juan Capistrano. Dental Implants San Juan Capistrano CA. Teeth Replacements San Juan Capistrano California.